Mikhail Pletnev entered the Central School of Music at the age of 13 and was awarded the first prize at the　International Tchaikovsky Competition in 1978. A gifted pianist, Pletnev has also achieved success as a conductor and is an active performer as Artistic Director of the Russian National Orchestra. Today, Pletnev is widely considered one of the finest contemporary pianists of his generation. Julian Saphir studied at the Royal College of Music, and is firmly re-establishing himself as one of Britain's finest pianists after a long absence from the concert platform. He is renowned for his remarkable blend of profound musicianship, hair raising virtuosity and the ability to entertain as both soloist and chamber musician. Julian's first venture with Kawai was back in 2005 where he enjoyed the twin roles of performer in and Artistic Director of his Master Musicians Concert Series at Harewood House, Leeds, UK which played host to a Shigeru SK-EX Concert Grand. The following year Julian chose the Shigeru for a performance of Prokofiev's Third Piano Concerto with the Harrogate Symphony Orchestra. Further concerto performances have included Rachmaninoff's 2nd and 3rd in 2009 and 2012 respectively. As well as a touring concert pianist, Julian is also a highly dedicated and experienced teacher. His students have come from far and wide and are inspired by his undiluted passion for music and its greatest figures. Julian recently set up his music education project Saphir Inspires -Piano Workshops. He has travelled all over the UK to schools and colleges presenting his Masterclasses and performing to young pianists of all ages and abilities. He plans to extend the project internationally next year. Ashley says about Kawai: "The Shigeru Kawai EX Concert Grand is the Crown Jewel amongst Kawai's pianos and is a model representing world class craftsmanship. It offers boundless possibilities for expression and delivers a deeply powerful and engaging creative experience." British pianist Ashley Fripp has recently performed throughout the UK, Poland, Germany, the Netherlands, China, Japan, Australia and the USA, at such prestigious halls as the Carnegie Hall (New York), Royal Festival, Barbican and Wigmore Halls (London) and the Audimax Hall (Regensburg). He has won prizes at more than a dozen national and international competitions, including the coveted Gold Medal from the Guildhall School of Music & Drama, Diploma of Outstanding Merit at the 8th Hamamatsu International Piano Competition, 1st Prize at the Brant International Piano Competition and the Award for Keyboard at the Royal Over-Seas League Competition. He has also made appearances on BBC television and radio. He is a First Class Honours graduate of the Guildhall School of Music & Drama where he is currently pursuing postgraduate studies with Ronan O’Hora. Future plans include performances throughout the UK, France and Germany. His CD recording of both Chopin Piano Concertos will be released by Spektral Records in Spring 2013. The award-winning concert pianist Warren Mailley-Smith has made his solo debuts to critical acclaim at Wigmore Hall London and Carnegie Hall, New York. In 2011 he made his much anticipated debut with the Royal Philharmonic Orchestra in a performance of Beethoven’s Emperor Piano Concerto. Warren is in increasing demand as a solo concert artist, having been described recently by Classic FM as 'Stunning...', 'Fantastic...' 'Sensational', 'Huge UK talent...', 'Gorgeous...!' and by BBC Music Magazine as ‘Rising Star – Great Artist of Tomorrow” . He was recently featured as CD of the Week and Video of the Week on Classic FM and Classic FM TV respectively. He has received over thirty invitations to perform for the British Royal Family at Buckingham Palace, Highgrove House and Sandringham House. Warren studied at the Royal College of Music where he won numerous postgraduate prizes including a Countess of Munster Award and the French Piano Music Prize. He then took further private studies with Peter Feuchtwanger and the late Ronald Smith. Warren’s solo career now sees him performing in festivals and concert venues across the UK, accepting invitations from further afield to perform in Europe and the US. His concerto repertoire includes works by Rachmaninov, Beethoven, Chopin, Liszt, Mozart and Tchaikovsky and he works regularly with duo partners Rowena Calvert (cello), Susan Parkes (Soprano) and Matt Jones (violin). Lara started to play the piano at age of 6 and she has won the BBC Young Musician 2010 competition at age 16, performing Saint-Saëns Piano Concerto No.2 in the final round, with Vasily Petrenko and the BBC National Orchestra of Wales in Cardiff. "Music overcomes all barriers and languages." Italian pianist Alexander Gadjiev has been awarded the 1st prize by a panel of judges at the 9th Hamamatsu International Piano Competition (held in the city of Hamamatsu, Japan, from 22nd November until 8th December), following a series of performances playing the Shigeru Kawai SK-EX full concert grand piano. The SK-EX was also selected by a number of other prize-winning contestants and finalists. Kawai has provided instruments for official selection in the Hamamatsu International Piano Competition since the inaugural event was held in 1991, with top prize winner Victor Liadov selecting the EX concert grand piano at the 2nd competition held in 1994. A record 449 pianists from around the world applied to compete at this year’s 9th competition, with 72 participants selected to perform. Following three stages of qualifying, the final round was contested by 6 participants, with the first prize awarded to Italian pianist Alexander Gadjiev, who selected the Shigeru Kawai SK-EX full concert grand piano throughout the competition. Speaking after the final, Mr Gadjiev, who also received the competition’s Audience award, explained that he had selected the SK-EX for its supremely colourful tone, allowing a great range of musical expression to be achieved. Third place prize winner Alexei Melnikov (Russia), Fourth place prize winner and Chamber Music award winner Florian Mitrea (Romania), and Diploma of Outstanding Merit award winner Miura Kenji (Japan) also selected the Shigeru Kawai SK-EX throughout each round of the competition. As one of three piano manufacturers’ instruments available for official selection, the Shigeru Kawai SK-EX proved extremely popular among contestants throughout the competition. In the first round, 24 of the 72 participants selected Kawai, followed by 11 out of 24 contestants in the second round. Of the remaining 12 participants that reached the third round, 7 pianists selected Kawai, while the final was contested by 6 individuals, 3 of whom performed using the SK-EX. 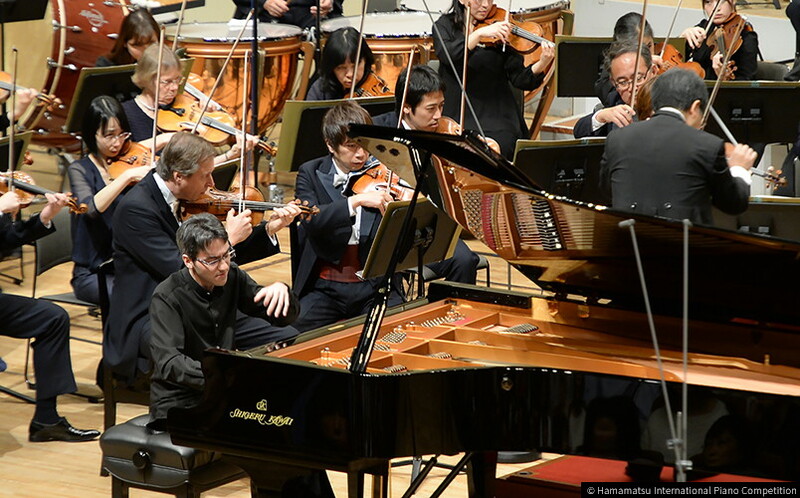 Established in 1991 to commemorate the 80th anniversary of Hamamatsu’s inauguration as a city, the Hamamatsu International Piano Competition is held every three years, and seeks to promote the unique musical history and tradition of the region. The competition provides an opportunity for young pianists from all corners of the globe to exhibit their technical skill and artistic ability, while advancing international exchange through world music culture.